Thick, hulking interior presence with a considerable amount of length. Is an above average athlete for size, as he possesses the short area quickness to be a nuisance for interior offensive lineman. Has exceptional lateral agility to defeat cut blocks and split gaps against zone blocking schemes. Impressive bull rush, as he locks out and drives his lower half while condensing the pocket considerably. Stout lower body, as he takes on double teams successfully so linebackers can scrape free from contact. Consistently able to stack, and shed blocks in the run game. Exceptional eye discipline as he shows a constant ability to find the ball. Effort runs hot, as he doesn’t take plays off often. Plays with admirable gap discipline, as he often forces bounce or cutbacks. Legs and arms work together, as he can strike and move laterally in attempt to find the ball simultaneously. When he can’t get to the passer, shows exceptional awareness to stick his hands up and deflect passes. While he possesses impressive physical and athletic tools, that has not lead to the expected production. Needs considerable development as a pass rusher, as he has not consistently produced in that area. Relies on physical and athletic gifts, while being quite raw technically. Often relies on the bull rush, without possessing a wide array of effective counters. Often puts himself in an advantageous position to make a play, yet he doesn’t consistently finish. Limitations with his hands often causes clear access to his chest. Hip tightness can cause limitations in space, which can be seen especially on stunts. More of a lateral player, as he often is not a force as an upfield penetrator. Dropping weight and leaning out his frame would due him well at the next level. Was suspended for last two games at the end of the season for testing positive for a performance-enhancing substance. 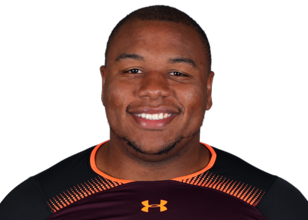 Dexter Lawrence has an impressive array of physical and athletic tools, however in order to be an elite interior presence he needs to develop his hands, and overall technique considerably. He is an impressive interior presence, and offers the frame and block shedding ability to be a force against the run. However, his pass rushing ability is modest and needs considerable development in that area to become more well rounded. With that being said, Dexter Lawrence has a high ceiling that could be reached in due time.